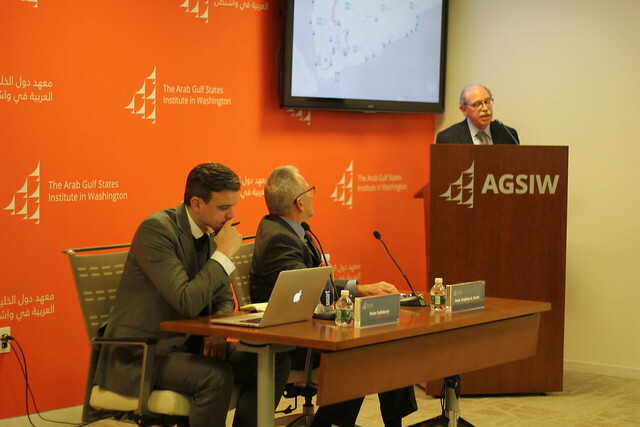 On January 18, AGSIW hosted Non-Resident Fellow Peter Salisbury for a discussion of his Chatham House paper, “Yemen: National Chaos, Local Order.” The conversation was moderated by AGSIW Executive Vice President Stephen A. Seche. Ambassador Gerald M. Feierstein, director for Gulf affairs and government relations at the Middle East Institute, joined the conversation as a discussant. Salisbury argued that the conflict in Yemen is not simply a binary one between the government of President Abd Rabbu Mansour Hadi and the Houthis, but that it has various internal and external stakeholders, with different motivating factors. In his presentation, Salisbury pointed out several zones of control in Yemen, including areas held by the Houthis, who receive Iranian support, and zones of contestation, as well as many different territorial divisions in the north, east, and, particularly, south. Salisbury highlighted several external actors, including Iran, Saudi Arabia, the United Arab Emirates, and Oman, that are all key players in the conflict. Former Yemeni President Ali Abdullah Saleh had played a very active role in the conflict, until his death at the hands of the Houthis in December 2017. Saudi Arabia’s motivation stems from its interest in being the dominant player in the region and its desire to push out Iran’s influence. Historically, Yemenis have been good at resolving internal conflicts since Yemeni tribal culture relies heavily on bargain making, but foreign involvement, and an increased flow of money to support the conflict, have increasingly complicated matters, reducing incentives to end the fighting. Seche asked what might happen if the Houthis were overcome, noting if the larger war were won, it could open the door to many small conflicts in Yemen. In response, Salisbury noted that the traditional mechanisms for ending conflict are eroding, and the common elements that held Yemenis together are slowly disappearing. Therefore, Salisbury argued for a diplomatic solution to the conflict, one in which all sides are engaged. Agreeing with Salisbury, Feierstein argued that much of the reconciliation effort can, and should, be done by the Yemenis themselves, as was seen in efforts following the 2011-12 Arab Spring. He added that one of the main problems in Yemen today is the increased fragmentation of Yemeni society and the lack of cohesiveness among the various groups; each has an agenda and there is a lack of unity in finding an end to the conflict. Feierstein added that the international community should be supporting the internal groups that would like to see Yemen as a traditional Westphalian state. Feierstein added that security in Sanaa must be prioritized in order to reopen foreign embassies and secure an uninterrupted aid flow.